The leader of one of the world’s largest food companies, Sunny Verghese, has labelled Australia’s agriculture industry as the most advanced in the world, saying it is positioned for future success with food. 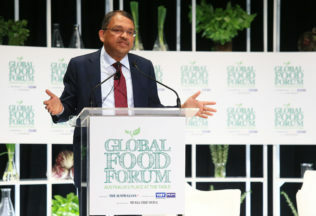 Speaking at The Australian’s Global Food Forum in Sydney yesterday, Verghese, founder and Chief Executive of Olam International, said he considers Australia the most innovative agricultural nation in the world partly because it has resisted the temptation to subsidies food production. “The OECD markets, the OECD countries, today provide about $400 billion of farm subsidies, and when you have those kind of subsidies, there is really no incentive to get truly efficient,” Verghese said. Verghese further used his speech to say attention must be paid to the impact on the environment food production is having. “We have about six biomes around the world,” Verghese said. “And earth scientists have said that you cannot have – you must have at least 80 per cent of the biomes – of all the biomes in the world intact. Verghese further spoke about what Olam itself is doing to help address environmental issues, including launching Olam Inside.